This is one of those weddings where EVERYTHING comes together and I get the opportunity to create something that I feel hugely proud of. This Painted Rock Winery Wedding had beautiful decor (thank you Vintage Origami), the best shooting partners (Blush Photography), diffused lighting (thank you BC Wildfires) but most importantly a couple who were so down to put their all into helping us make the best film possible. Taryn and Mike met in the famous Drake Hotel in Toronto and were kind enough to share their story with me in a short interview session. I love hearing stories where fate seems to play a part. Mike didn’t want to go out that night and he wasn’t the type of guy that would just walk up to a girl in the middle of the dance floor. But as he said, there was just something about that night. For some reason he felt compelled, and here he is, expressing himself in the most sincere way about the love of his life. I can’t describe how much I appreciate it when couples open themselves up to me. When someone is open to revealing their inner thoughts and feelings it can add so much depth to their story. When I spoke to Taryn and Mike over Skype they told me how this was going to be a destination wedding for them (since they were from Toronto). When ever we do destination weddings I always pitch the idea of filming a little extra since we’d be travelling the day before anyway, and there’s usually some kind of extra event with friends and family. I think seeing a couple outside of the wedding itself opens up their “world” a little. Its an opportunity to film something more candid, away from the spectacle of a wedding day. It also allows guest to get a little more used to the idea of cameras being present and for us to gauge the spirit of the event. The wedding day itself couldn’t have gone better for us. 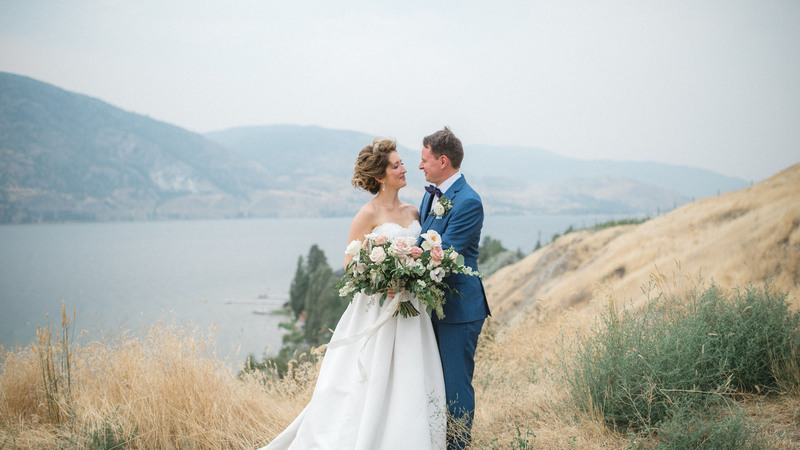 We got to spend a ton of time with the couple while they were getting ready at Penticton Lakeside Resort, hanging out, writing vows and getting excited by the day. Smoke from the wildfires was still lingering over the Okanagan and beautifully diffused the sunlight. Throughout the day the gusty wind picked up and dropped enabling us and Blush Photography to capture dramatic visuals. Taryn and Mike picked some great venues for their wedding. Penticton Lakeside resort is, well, right on the lake. We had so much space and natural light to work with, as you can see in the video. They also had rooms right next to each other which meant we could pop between rooms and film both. Normally we split up between the bride and groom, but working together means we can capture multiple angles and the same time and add tons of variety to the visuals. Painted Rock Winery is a stunning vineyard perched on a cliff above the lake. We loved the modern architecture and beautiful gardens. The wine was great too of course! There were so many great spots for the portrait shoot dotted around the grounds. Honestly, you could shoot all day, especially if you explore some of the surrounding beaches and parks too. Its no surprise Taryn and Mike’s wedding was featured in Wedluxe Magazine. Vintage Origami’s decor was splendid, Sondra Richardson led a perfect ceremony and Alex Baird and The Young’uns got the crowd whipped up for a great night of partying. I must send a shout out to Dream Big Event Management who helped us to keep on track with the running of the day and organizing our very easy meal from Brodo Kitchen ; ) Finally, a big thank you to our friends Kristy and Ken from Blush Photography. Its always a pleasure and they sent me the beautiful portrait shot of the couple which is featured above. We are a bit speechless, this video blows our expectations out of the water. It is the perfect summary of our big day and the floods of memories just pour it. We are both a bit emotional watching it all back, but we are so so happy with the final product, and could not have selected anyone better to capture the day, so thank you for all of your hard work on the day and with the edits – we may be bias but we think that is is just absolutely perfect. I hope you enjoy this film. You can see more of our work over at our PORTFOLIO . If you’re interested in Wedding Cinematography in Penticton, British Columbia or anywhere else in Canada please contact us HERE! Cake by The White Apron Pastry Co.